CHEYENNE, Wyo. — People who have long been critical of a plan to put more cell towers in Grand Teton National Park are getting the opportunity to officially weigh in on the project. Grand Teton National Park in western Wyoming seeks thoughts from the public on plans for a new network of cell towers amid questions about how the National Park Service balances public safety with the experience of wilderness. The park currently has two cell towers as part of a system built piecemeal-fashion, with some fiber-optic lines buried without conduit and poorly mapped. The lines are vulnerable to damage, according to a Park Service analysis and proposal for nine additional towers and related equipment. 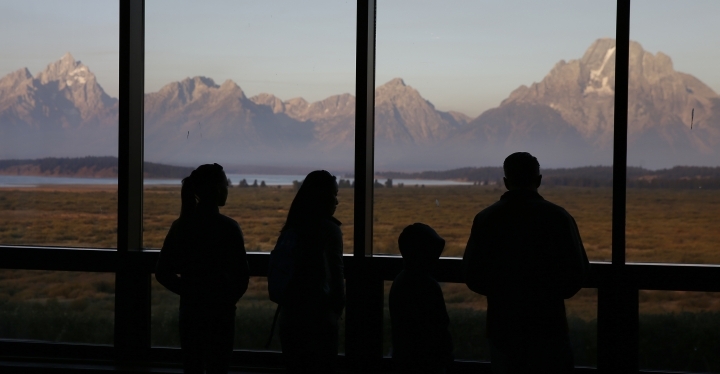 "The current equipment and services that we've got are outdated, they're inadequate and they don't serve us well, nor do they serve park visitors or our partners well," Grand Teton spokeswoman Denise Germann said Wednesday. Outages lasting several days have been known, Germann said. The new towers would be built in already developed areas not far from the park's main roads. Benefits would include boosting the range where people could call for help, directing visitors to park services and helping retain seasonal workers by keeping them in touch with friends and family, according to the Park Service. Grand Teton plans two public meetings and will take comments from the public on its proposal by April 10. With approval, construction of the new system could begin as soon as this fall, according to Germann. One group questions whether the Park Service gives sufficient consideration to the implications of cell service in the backcountry. "Part of the point of wilderness is the ability to be disconnected and feel alone, but if somebody on the same trail can order a pizza, or sell stock, or chase Pokemon, that takes away from the visitor experience," said Jeff Ruch with the group Public Employees for Environmental Responsibility. This isn't the first time PEER has questioned cell towers in Grand Teton. In 2018, the group obtained Park Service documents outlining the proposal and raised concern the park might put up the towers with little public involvement. The Park Service lacks a comprehensive policy for cell facilities, Ruch said. "Do they want to wire the wilderness?" Ruch said. "They say, 'No, no, we don't intend to do that, but we're not taking any steps to prevent it.'" Cell coverage still wouldn't reach much of the park, Germann said. Unlike some other national parks, Grand Teton does not have any designated wilderness, where machinery such as cars, trucks and even chain saws are prohibited by law. However, Grand Teton has over 190 square miles (500 square kilometers) of recommended wilderness that includes the main summits of the Teton Range in the western half of the park. Cell phones are already common in those areas and signs encouraging people to practice courtesy would help address any unintentional increase in cell-phone use, according to the Park Service proposal. Park officials could require companies installing cell towers to direct coverage from backcountry areas, Ruch suggested. The Park Service encourages people with ideas to improve the cell tower proposal to submit comments, said Germann.